We offer four treatment rooms, warmed massage tables, hot and cold therapies, relaxing music, essential oils, soft lighting and a warm towel at the end of your massage. We use all organic massage oils and creams to nourish your skin with the best possible ingredients. Free parking is available on the street and in our parking lot at the rear of the building. 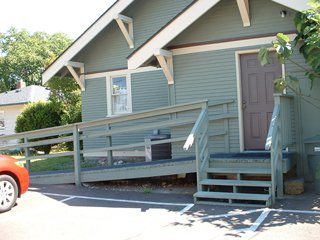 Located in the historic Columbia-Eldridge neighborhood in Bellingham. Convenient wheel chair access at the back entrance. Click here to get specific driving directions from your location. Take Interstate-5 South to the Northwest Avenue exit, exit 257. Drive South on Northwest Avenue for approximately 1.6 miles. Northwest Avenue becomes Elm Street. Drive South on Elm Street approximately 0.3 miles. 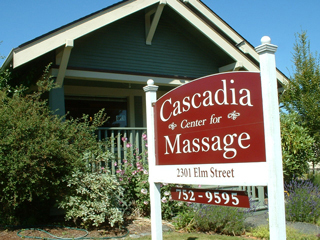 Cascadia Massage is on your right at the corner of Elm and Washington Streets. From I-5 Northbound take the Lakeway exit. Follow Lakeway, which becomes Holly street, through downtown and old town to the traffic light at Broadway. Turn right onto Broadway and proceed 1 block to the next traffic light. Turn left onto Elm Street. Travel 1 block on Elm and Cascadia Center for Massage is on the left at Elm and Washington.